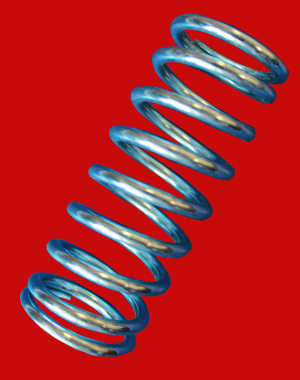 The springs are manufactured from a patented steel wire, according to EN 10270-1. The processed wire diameter is in the range from 0,2 to 11, 8 mm. There is possibility to produce from EN 10270-2 the diameter 20 mm for special orders. Further we use a stainless steel of quality EN10270-3, (12R10 – Swedish steel Sandvik) of the diameter from 0,16 to 8 mm, or from a bronze wire CUSN6 of diameter 0,25 up to 3 mm. We produce according to handed over documentation (drawing) at conditions of CS Standard 02 6002 (see specification) or according to placed dimensions and also according to handed over sample in any quantity. There is possibility according to customer’s wish to carry out the measuring of the tension and compressing forces including the certificate issuing for the tension and compressing springs.